How to exchange damaged bank notes? UPDATE: These rules have since been revised in Dec 2018. The updated refund rules are discussed in blog post Damaged Notes: RBI Rules To Exchange And Claim Refund. It always gives a bad feeling to carry a dirty or damaged currency note in our pockets. So we try to palm it off to an unsuspecting person or donate it to God. Well, you don't need to take such dubious steps to get rid of your shabby or torn notes. Specific guidelines laid down by RBI — i.e. Reserve Bank of India (Note Refund) Rules, 2009 — permit you to exchange them for a better one. 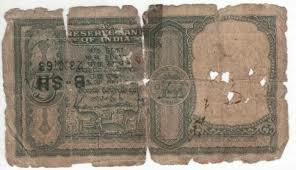 a. Soiled Banknote: This is one which has become dirty due to daily use. Two pieces of the same note pasted together, so that it becomes one proper entire note, also comes this category. b. Mutilated Banknote: This is when a portion of the banknote is missing. It also includes those that have got torn into 'more than two' pieces. c. Imperfect Banknote: Wholly or partially obliterated, shrunk, washed, altered or indecipherable banknote, which does not come under the mutilated note category, is defined as an imperfect banknote. Is your Bank Note Soiled, Mutilated or Imperfect? RBI has authorized all banks to accept and replace the damaged banknotes. In fact, they have to extend this facility of exchanging damaged notes to everyone i.e. their customers and even the non-customers. 1. You will get full value for the soiled notes. iv. Notes up to Rs.20 cannot be exchanged for half value. 3. For imperfect banknotes full / half value is paid... on the same lines as mutilated notes... provided the printed matter on the note is not totally illegible and it can proven that it is a genuine note. Banks receiving such non-payable damaged banknotes have to retain and send them for destruction to RBI. Here's a very interesting point when it comes to the exchange of damaged notes. The value of exchange of any note is not dependent on the presence or absence of its serial number (or, for that matter, any other specific feature).